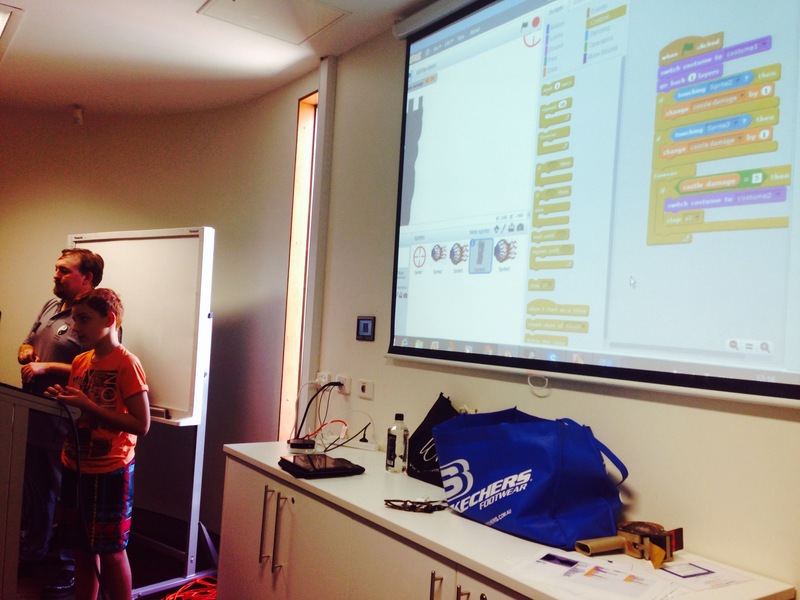 Home › brisbane › CoderDojo Chermside Library wrap up! CoderDojo Chermside Library wrap up! We had our last session for Term 1 at Chermside Library on Saturday with the kids demonstrating the great work they’ve created throughout the six sessions of CoderDojo Brisbane. What the kids achieved was amazing with some creating fully-functioning games. One of our participants Griffin was able to create a great game that incorporated various aspects of Scratch. The aim of the game is to shoot the eyeballs before they hit the castle. Griffin incorporated a set amount of lives and if the eyeballs hit the castle three times, it was game over. The kids were excellent in their encouragement and feedback with some great suggestions for improvement including adding sound and extra levels. Hopscotch – teaches kids to code using simple and intuitive building blocks. Pythonista & Python – is an integrated programming development environment. Codea – lets you create games and simulations on the iPad. The mentors and participants had fun playing with a variation of Flappy Bird on the iPad, ‘Flappy Octopus’ hacking the code in order to make it much easier to play. The code was changed so that the width between the pipes was much bigger. As you can imagine, the scores were much higher than usual! Makey Makey demonstration – who knew that grapes could be made into a piano? 3D printer – amazing new technology used to print our very own little MakerBot. We had an excellent game demonstration called Vega Conflict. Anna was also able to teach the kids the dynamics of the game development process and the different roles in a team to create the end product. Scratch was explored in great depth, where the kids were able to create some fantastic games. Our mentor Justin demonstrated the capabilities of Scratch with his Space Invaders Game, incorporating sound, graphics, images, music and various levels. A huge thank you to all our great mentors for all their support and for continually demonstrating new and exciting programs to the kids. It was evident that they were all inspired by the big wide world of coding and what it can offer. Sessions at Chermside Library will kick-off again in the second half of the year. Subscribe to http://www.coderdojobrisbane.com.au for all the latest news and updates on when registrations open. You can also follow CoderDojo Brisbane on Twitter and Facebook. Carindale’s last CoderDojo Brisbane session for Term 1 is this Saturday with Sunnybank Hills and Mt Ommaney Library continuing for another two Saturday’s. 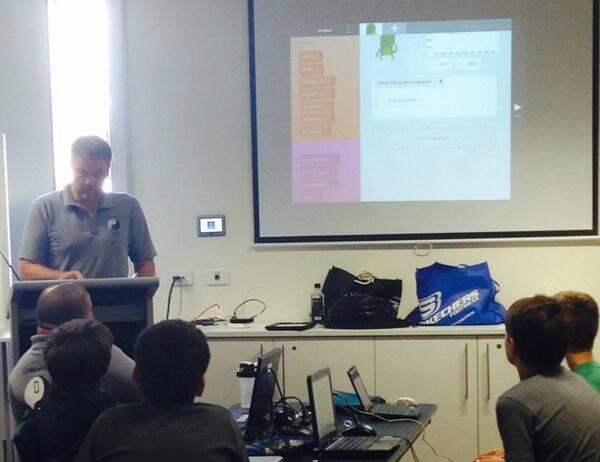 ‹ CoderDojo Brisbane – inspiring the next generation!